You may or may not remember when Puma first introduced a smart sneaker to the market in 1986, but there's no doubt the design was ahead of its time. The RS-Computer shoe was the first to bring sophisticated electronic hardware and software into the sports experience. It was basically the original Fitbit, or Garmin running watch. Now Puma is re-issuing the iconic sneak, with upgraded tech in the famed iconic design. 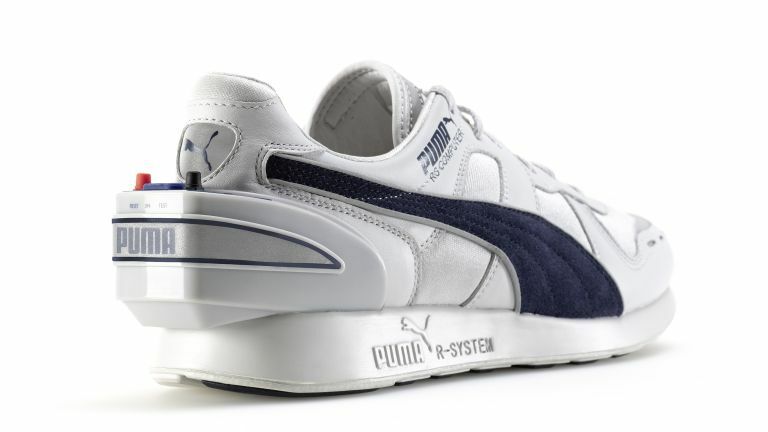 In 1986 the RS-Computer running shoe was considered extremely advanced for its time, and, according to Puma "revolutionised the way runners trained". The original RS had a custom-designed computer chip built, not-so-subtly into the heel that automatically recorded the time, distance and calories expended. It could communicate the results once connected to any Apple IIE, Commodore 64 using a 16-pin cord. This gave runners the ability to compare past runs with future goals, learning and understanding how to become faster, more efficient, and competitive. Material-wise, the OG RS-Computer is decked in a textile and leather upper, padded collar, Multiplex Four midsole technology, a rubber outsole and a unique, extended TPU heel that housed the computer chip. The 2018 re-issue has new technology but replicates the original experience. First of all, you no longer need a cable to plug your shoe into a computer. Instead it's fitted with Bluetooth, and can be paired with a dedicated RS-Computer Shoe app (available on the App Store and Google Play) complete with 8-bit graphics. The new RS-Computer retains the original Lunar Rock – Limestone – Peacoat colorway and design. Interested in snagging a pair? You'll have to be incredibly lucky – only 86 pairs will be available globally. Each pair has a number that appears on a woven label inside the tongue. The new RS-Computer will be sold at Kith, PUMA Stores in Berlin; Harajuku, Tokyo and Carnaby Street, London on December 13th, they'll cost €650.